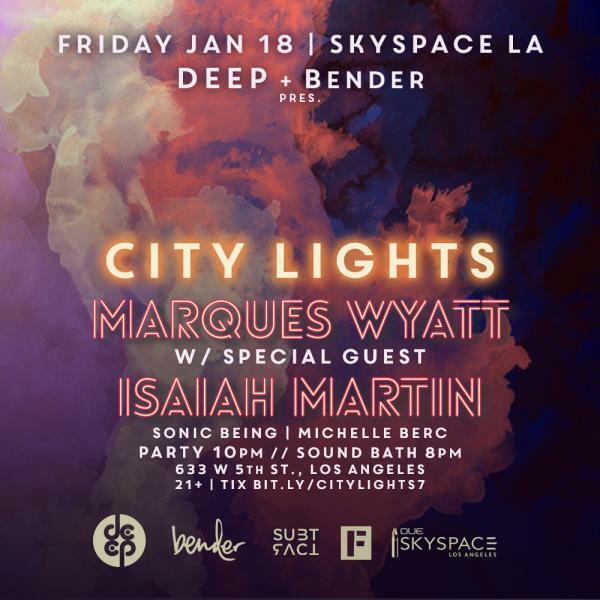 DEEP Los Angeles & BENDER pres. Back in 2019 with a fresh look + new experiences. It’s the dance party in the clouds, where we SHINE and groove from 1,000 feet above a sea of lights. \\ EARLY ARRIVAL — is recommended. Getting to the 70th floor from lobby can take 15 to 20 minutes. And *** ENTRY CLOSES at 1am ***. \\ SKYSLIDE — the venue has a signature glass slide that you can ride, suspended outside the building. Its is free for all event guests — and is open until 130am. \\ SUGGESTED PARKING is $8 flat rate after 5pm at the Westlawn Parking Garage at 524 S. Flower St.
\\ ENTRANCE (Skyspace lobby) is up the outdoor stairs on 2nd level at 633 W 5th St.
\\ NO SMOKING — this is a 100% non-smoking venue (both indoors and the outdoor decks). If you’d like to smoke, you can take an elevator to the ground floor, then re-enter the building.